Universal Exports is proud to continue a unique work of fan fiction by Kit Sullavan. In this series, Kit presents a look at what Q's dossiers on James Bond's cars may have contained. These detailed reports contain information on the cars themselves, coverage of Bond's mission in these cars and recaps written years later by Kit. Agent #007 (James Bond) was issued an updated, new model Aston Martin DBS sometime around 1969. While the DBS was mechanically identical to the previous DB5, it is unknown (or at least…unrevealed) if the ‘Q’ modifications were installed on this model. The nature of the missions and extreme escalating levels of danger encountered by Bond on each of his subsequent assignments seems to suggest that it is only natural to assume that this vehicle had the same modifications as the previous vehicle, if not more. However, that is only informed speculation. The next mission of Commander Bond’s that mentions any type of vehicle used by Bond during that mission does not actually include a ‘Q modified ‘vehicle. The details of the mission are left somewhat vague in the documents, apparently due to the fact that Willard Whyte, the celebrity hotel and casino billionaire out of Las Vegas may have been the victim of some international diamond smugglers using his organization as a front. Out of deference to Mr. Whyte’s reputation as well as his continued financial support of many government programs, the US government has surely protected his interests with a broad ‘gag order’ concerning this mission. However, the circumstances of Bond’s use of an American citizen’s car during the course of this assignment are well known and legendary amongst many Las Vegas citizens as well as many former Las Vegas police department officers. The official report on case: MI6-DAF007-#7 details the following events concerning Commander Bond’s use of a 1971 Ford Mustang Mach 1 belonging to American citizen Tiffany Case. The following report was pieced together from interviews from several police officers and officials, many eye-witness bystanders, and from Ms. Case herself. Bond and Ms. Case left the desert after spending a quiet day of ‘romantic sightseeing’ (from Ms. Case’s deposition) and headed back into the city proper with Bond driving. Upon arrival on the ‘Strip’ in Las Vegas, A police cruiser pulled them over, while another blocked their progress. Fearing that the local police were on the ‘payroll’ of the supposed diamond smugglers, Bond fled the scene at a high rate of speed. Many local police cruisers joined in the chase all throughout the famous Vegas strip and surrounding areas. Commander Bond’s amazing high-speed driving ability coupled with the Mustang Mach 1’s high-performance engine and handling suspension allowed Bond to easily escape the pursuing officers in their heavier, slower police cruisers. Many eyewitness bystanders claim to have seen the Mustang driven by Bond at speeds of up to 120 mph careening on and off of public sidewalks, and there was even one eyewitness who claims to have seen the Mustang fly over (!) a parked trailer to escape a packed casino parking lot with police cruisers in pursuit! 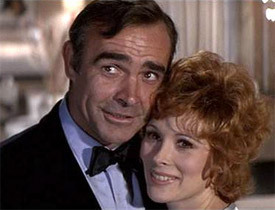 According to James Bond's report on the Diamonds Are Forever incident, "Two wheels? You must be joking. 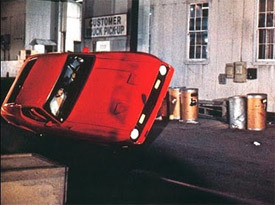 Who could drive a car on two wheels..."
While supposedly pursuing Bond down a side alley, one Las Vegas police officer claims to have seen Bond somehow tilt the car on two wheels, and continue to drive through the narrow alley to escape the other end. Other than the officer who makes the claim, there are no other witnesses to this event and it is felt that it probably did not happen. Considering that the officer seriously wrecked his cruiser during this pursuit down the alley, it is felt that he is either mistaken due to the trauma of the accident itself, or that he made up the entire event to escape reprimand from his superiors. Clearly, the remarkable details described in this event have been remembered in a much more exciting manner than what is probable. This type of event will raise the level of adrenaline in most individuals leading to a heightened sense of reality. This condition often causes many to remember things that never actually happened, such as the flying car, or the car driving on two wheels mentioned above. That same condition existed in local eyewitness bystanders on Bonds next assignment (MI6-MWTGG007-#9) where he was graciously provided the use of a local vehicle from a new-car dealership in Hong Kong. 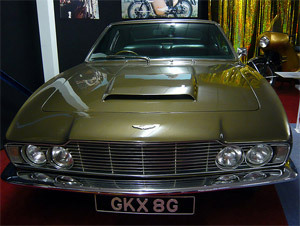 Bond chose a vehicle based on one criterion only: Pursuit ability. 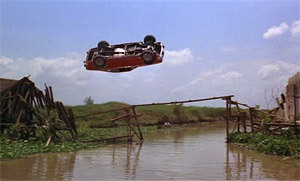 The American Motor Cars Hornet 'X' performs an impossible flip. 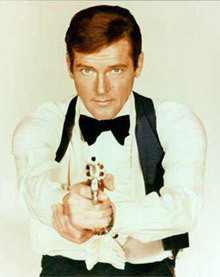 This proof goes against James Bond's statement of "A spiral jump over a broken bridge, really? Now you’re just being silly." With assistance from an American police officer on assignment from New Orleans, Bond and officer J.W. Pepper used an American Motors Hornet ‘X’ to pursue a vehicle with a kidnapped American CIA agent held captive within the trunk. Clearly an unspectacular vehicle in nearly every respect, the AMC Hornet ‘X’ had only one feature that made it a viable pursuit vehicle: a 360 cubic inch V-8. Clearly, the adrenaline-induced excitement of the high-speed pursuit must have affected Officer Pepper in the same fashion as the Las Vegas officers during the previous mission, for Officer Pepper later made the extraordinary claim that Bond somehow managed to jump the car across a broken wooden bridge over a canal during the pursuit, and that he also managed to rotate the car a full 360 degrees during the jump, to land on its wheels again and continue the pursuit! Disregarding the fact that this is clearly impossible, the adrenaline-induced condition can even affect trained police officers. "The car was a Mustang, one of the newer high-performance versions. It had one of those really big and powerful American engines in it…a 429 cubic incher, I think. It certainly wasn’t as refined as the Aston, and could never hope to handle with that level of finesse. However, the abundance of power to the wheels more than makes up for that in the real world. Not a bad car, really, if you like that sort of thing. I don’t." "Flying over a trailer? Really, they said that? I think it must have just appeared that way due to all the commotion and such…"
"Two wheels?...you must be joking. Who could drive a car on two wheels? And besides, I was never in that alley anyway." "I don’t really know exactly what kind of car that was…I think it was on loan to officer Pepper from the local dealership." "It seemed to have plenty of power, and it also had that American-style handling trait…terrible." "A spiral jump over a broken bridge, really? Now you’re just being silly." At any rate, the exploits of Commander Bond behind the wheel of various cars seems to defy explanation, even if the ‘official’ version is considerably watered down from what nearly every bystander claims to remember clearly.